Yearly updated Nirvana® Soundscapes include soothing chillout style music accompanied by breathing sound cues (using tibetan bowls sounds) indicating exactly how to breathe at which point in an exercise flow. Slow & relaxing music beat creates a magic atmosphere, while each exercise sequence has it's own dedicated sound track. 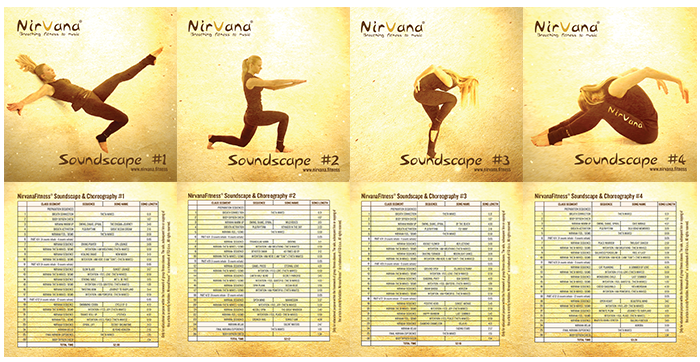 Amazing Nirvana® Soundscapes are used by professional instructors in group fitness conducting Nirvana® classes, while individuals enjoy it's effects within other applications (at home, work, nature ... everyday life). Nirvana® has developed a unique sound technology with the help of sound researchers & engineers that uses Theta waves to induce deep & effective relaxation state through direct influence on listener’s brainwaves. Brainwaves are electrical activity patterns caused by the neurons of the brain communicating with each other. Brainwaves can be detected using sensitive medical equipment such as an EEG. They provide an indication of the mental state of an individual. - Beta waves, emitted when we are consciously alert, or when we feel agitated or tense. Nirvana® ThetaWave sound technology aims to cause brainwave frequencies to fall into step with a periodic stimulus having a frequency corresponding to the intended brain-state. This can be used, for example, to induce sleep. Theta waves (at around 4 to 7 Hz) are the sweet spot for many brain functions. There, we often experience extreme relaxation, creativity, as well as vibrant mental imagery. For the past forty years or so scientists have experimented with different audio techniques to induce Theta waves. Technique is to play a specific audio rhythm to replicate the 4 to 7 Hz frequency of the Theta brainwaves. 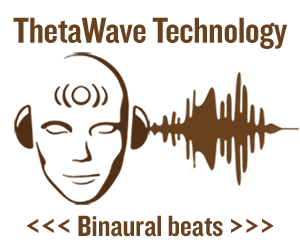 Nirvana® ThetaWaves can be experienced both on loudspeakers (two sound carriers have been specially designed to produce an interference at the desired theta frequency) or with a headset (binaural beats). When two tones of specific frequencies are played (one to each ear), the brain can become confused and produce its own, imagined tone—a three-dimensional audio hallucination heard only within the head of the listener. These frequencies influence the brain in more subtle ways through the entrainment of brainwaves and provide other health benefits such as control over pain.